At the finish line of the Dubai Marathon, I captured a few words of Ruth Chepngetich speaking in their local (Kalenjin) dialect with Emmanuel Saina on how the race had gone for her and a few challenges she had. She had then noticed Worknesh Dagefa coming to congratulate her and the press around them and she had immediately turned cheerful as she greeted them. However, to me, in some way, the scenario took me to the one that Eliud Kipchoge had found himself in at the finish line of the London marathon in 2016 when he had raised one hand to touch his head in what looked like a sign of disbelief as he crossed the finish line in 2:03:05. 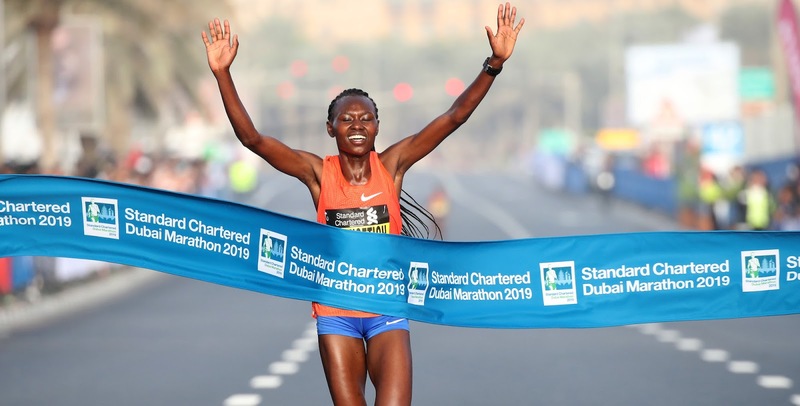 It was even at a lightly narrower margin that Chepngetich had also missed the world record here in Dubai marathon after running 2:17:07, becoming the third fastest woman ever only in her third marathon race ever. Talking to the press at the podium, Chepngetich dwelt on the positives and didn't try to find excuses for missing the record while everyone who watched the race agrees that we would now be having two women who have ever run under 2:17 for the marathon had everything gone well for her in the race. She said nothing about the problems she had, a considerable number of times, picking up her drinks and the fact that she appeared to have been actually pacing the pace setters at some sections of the race. But, instead, she expressed her happiness at having won the race and praised her nearest competitor, Degefa who finished 2nd in 2:17:41 for giving her a strong competition. Before Kipchoge could break the world record, there were many instances that he had come so close only to miss it due to some unavoidable circumstances. But, almost everyone had already known that he was a world record material and that it was just a matter of time before he could break the record. At the London marathon last year, he had run under world record pace but could not keep the pace to the end of the race due to the hot weather conditions during the race. His time finally came at the Berlin marathon where he set a new world record of 2:01:39 breaking the old one of 2:02:57 by such a big margin. It appears to be heading the same way for Ruth Chepngetich as well. Chepngetich came to the limelight at the Istanbul marathon last year when she ran a world leading time of 2:18:35 on a course that is well known to be relatively hard. The fact that she placed 10th overall, regardless of gender, in such a high profile IAAF gold label marathon race, beating some of the world's best male runners, was a great indication that Chepngetich was indeed a special runner to watch out for. Some fans may have seen her performance of last year at the Istanbul marathon as a one time performance in her life, but her performance on Friday, January 25, 2019, at the Dubai marathon is a confirmation that she is here to stay at the top and will soon be one of the athletes to be added in the topic of the greatest female marathon runners of all time in the years to come; if she hasn't been added already.